Pederson shrimp on a corkscrew anemone. Photographed in St. Vincent. St Vincent is known for coughing up some pretty weird and wonderful species, some of which are seen no where else in the Caribbean. I initially thought this might have been something pretty unusual for the Caribbean, but stand corrected by those with better ID ability than me . These wee beauties (max about an inch in length) typically live in what is called a commensal relationship with their host anemone. It’s considered commensal when one species (in this case the shrimp) benefits from the other (in this case the toxins from the anemone, which coat it and protect it from predation), while the host neither benefits, nor is harmed, by its presence. So it is different than a mutualistic relationship (ie an anemone fish and its host anemone, like I wrote about last week), in which both creatures derive benefits from the other. And that is in turn different than a parasitic relationship, in which one species (ie a copepod) benefits, while its host suffers. There is a photo earlier in my Instagram feed that shows a little red/pink bottom dwelling fish with ‘a party hat’ on its head. That thing on its head is actually a nasty parasite. It’s a complicated world down there, eh? Born and raised on the west coast of Canada, I have always felt a strong connection to the sea. But for many years, I stayed on the surface, afraid of what lurked down deep. When I was in my early 30's, with three young children (aka the P's), my husband (aka Mr G) signed us up for a SCUBA certification course, as a surprise. Although I had my fears, my stubbornness prevailed, and somehow I made it through four murky, frigid, cold water dives in Vancouver to successfully pass the course. Soon after we went diving off the west coast of Mexico, in the Sea of Cortez, where my eyes were opened to the beauty and other-worldliness of the life down under. And the rest, as they say, is history. I currently have well over 2000 dives under the belt, and I have been fortunate to travel extensively in Asia, Australia, Fiji, Galapagos, Costa Rica, California, the Caribbean, Mexico and here in British Columbia. After shooting hefty DSLRs for many years, I just switched over to a groovy Olympus Micro Four Thirds camera, in a Nauticam housing, with dual Sea & Sea strobes and a bag full of lenses. In addition to this blog and my personal website (Awoosh.com/Directory), which is linked at the top of the blog, my stuff has been widely published in a variety of magazines and websites, including an ongoing regular monthly feature on Scubadiving.com. All links to this work can be found in this blog. 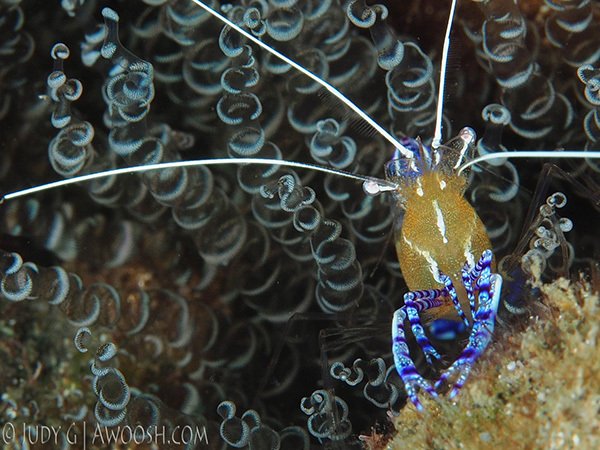 This entry was posted in All About Scuba Diving, Pic of the Day and tagged Pederson shrimp, Periclimenes. Bookmark the permalink.